Photographs are unruly, anarchic things. They never do quite what you expect. This may appear an odd claim, given that most photos seem to be so obvious, clichéd even. Don’t they perform reliably enough in advertising, documentary, and the family album? Yes and no. In many cases it is really the accompanying words that make them reliable. Captions, titles, commentary. What we read will shape and direct the possibilities in what we see. Deprive images of language and they soon revert to ambiguity. Try covering the text in this magazine and see if it is possible to figure out what’s going on. Or, take a look at the first image reproduced here. You probably have already. Clearly, it’s not a sunset or a selfie. What are you actually seeing? How are your eyes moving around this image? Are you searching for clues? Is it a landscape? A microscopic view? Is it a document? An artwork? It is almost impossible to know what this photograph is of, let alone what it might mean. In calling for explanation, a photograph like this can make us feel the gap between looking, reading and knowing. I am a curator of exhibitions, and recently I was invited to put together my “dream show.” That’s a phrase to raise the eyebrow of any Freudian, but I took it seriously. What could such an exhibition be? Nobody wants to see artists’ corny interpretations of their dreams. That would be almost as tedious as hearing your partner recount theirs over breakfast (it is for good reason that we pay analysts to listen). Dreams are untroubled by conscience or decorum. You are “innocent when you dream,” as Tom Waits once sang. A dream will defy the logic of time and space, too: things from an almost forgotten holiday combine with yesterday’s trip to the cinema. Moreover, there is often no obvious connection between what is dreamt and what it might mean. This is not unlike our initial responses to images. In those moments before we switch from free-associative looking to the authority of words, we are free to react as our impulses take us. We intuit that an image cannot carry a message the way a truck carries coal, and so we are not held by rational thought. Why not begin an exhibition with that particularly odd photograph? It’s an image so wide open it could mean almost anything, or nothing. A risky start. Relocating to Paris, Man Ray brought the photograph with him. Surrealism, with its interest in the unconscious and the uncanny, was blooming. In October 1922 Man Ray’s image was published in a little journal with a deliberately misleading caption: View from an aeroplane (much later it would be titled Dust Breeding). Seeing earth from above is disorienting, but wartime aerial reconnaissance photographs had already become common currency in newspapers and magazines. Devastated cities have an unsettling beauty. Meanwhile, many avant-garde photographers were starting to shoot unexpected subject matter from new angles, attempting to revolutionize perception itself. Also in October 1922, TS Eliot published The Waste Land. The great dream-like poem of the interwar era picks over the rubble of western civilisation like a literary detective, stacking up quotations and allusions as fragments of evidence. “I will show you fear in a handful of dust,” warns Eliot. To many writers and artists of the 1920s the ideal of a rational, stable order was looking more like a fantasy. What if The Waste Land and Man Ray’s photograph of dust, appearing that very same month, were harbingers of the ensuing century? This would be the theme of the exhibition. Any photographer will tell you that dust has a double-edged relation to the camera. It must be kept well away from the equipment but it is deeply photogenic. Floating in the air, dust motes catch the light, and settle on hard surfaces as a soft glow. There is also something universal about dust. We come from it, go to it, and create it daily with all the inevitability of breathing, and dying. So, an image of dust, even one as obscure as Man Ray’s, is likely to have all manner of resonances and associations. Some will be yours only, but many will be shared, from the epic scale of the aerial view and the abstract landscape, to the close –up world of forensic imaging. 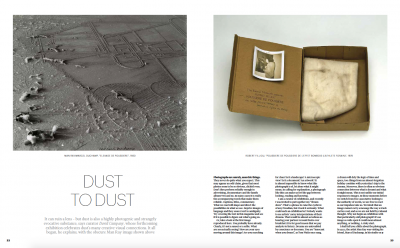 Beyond these associations many artists have explored the idea of dust as material and metaphor, with its allusions to time, mortality and ruin. For example in the early 1970s the Californian John Divola began breaking into disused houses, and turning arty vandal with knife, aerosol can, string and cardboard. He would make mysterious, ritualistic interventions in the corners of rooms and then photograph them. Rich in narrative implication, his images slip between forensics, performance art, sculpture and fine art photography. The visual and conceptual similarity to the Man Ray photograph is striking. A little later, the French the artist Robert Filliou had himself photographed cleaning (without permission) the dust from one hundred artworks in the Louvre. A Polaroid and a stained white cloth from each painting would be put in a small open box and exhibited. Filliou even suggested, teasingly, that the aura of these paintings vanished with the removal of the dust. More recently Eva Stenram placed under her bed colour negatives of images that NASA sent back from the surface of Mars. She allowed balls of dust to gather on them before making prints. The cosmic and the domestic implications of dust are conflated. Ristelhueber kept one image back, thinking it looked too much like its inspiration. In 2007 she printed it as single work, titled À cause de l’élevage de poussière (Because of the dust breeding). It is a striking photograph, and its genesis speaks volumes about the unpredictable effects that images can have upon us. An artist photographs an ex-warzone and her visual template is peculiar, semi-abstract view of a half-finished artwork made seventy years earlier, on another continent. No logic can account for that. We don’t file images in our minds the way they are filed in an archive, or searched for online. Words will not come close to accounting for the madness of images.